A journalist by profession, my work includes writing and editing for newspapers, not for profit organisations and businesses. The benefits of kids being engaged in art activities are vaster than just providing them with the opportunity to be creative. Activities such as art, drama and music are all regarded as helpful in building children's confidence, and learning problem solving and critical thinking. My kids really enjoy art and are fortunate to be exposed to it regularly at school. But they also love the opportunity to do extra art classes after school or during the holidays, and their visits to Tania's Arthouse in Cleveland are a real highlight of the week this school term. 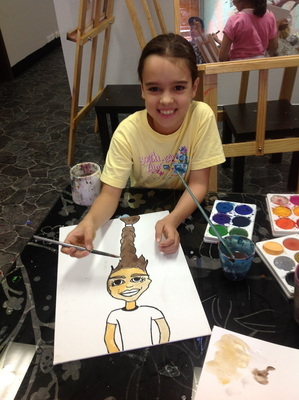 Tania runs a range of art classes for kids and teenagers, as well as for adults. Each term's projects are varied, and there are always a range of activities and different art media. Some projects they work on for a few weeks, and others are completed more quickly. Last year's projects included an Egyptian canvas painting and Christmas projects using clay. During one school holiday, my son and a friend did a skate deck painting class, which was a real hit. Creating a cartoon picture of themselves was also a fun lesson during which they learned some new techniques. Tania runs weekly classes for ages 6 to 11 and for ages 11 and upwards, as well as lessons for adults. Projects for kids may include drawing, printmaking, mosaic activities, painting, clay modeling, painting on class, and taking their photographs and using the pictures for additional activities. Kids in the older age group are currently creating artworks to be displayed at a local art exhibition, but the projects change each term. There is also more freedom for teenagers to choose their own projects. T.A.H. Gallery is a small art exhibition space in the Arthouse premises, which Tania makes available to students and local emerging artists. The students also have the opportunity to engage with the emerging artists as part of this initiative. Tania also runs holiday workshops – it's advisable to book well in advance as they are very popular – and hosts children's birthday parties. Party activities can include drawing, painting, sculpture, printmaking, collages, and jewelry making. All materials for the party are supplied and, as an extra special option, the Gallery can be booked to feature the birthday boy or girl in their own solo art show. In addition, Tania is available to be contracted to paint indoor and outdoor murals, such as in children's bedrooms or at community centres.